The Nebelung cat breed was developed by Cora Cobb (Nebelheim). The first two registered Nebelungs were Siegfried (born 1984) and Brunhilde (born 1985). Siegfried’s mother was a black domestic shorthair cat and Siegfried’s father was longhair cat that resembled a black Angora. 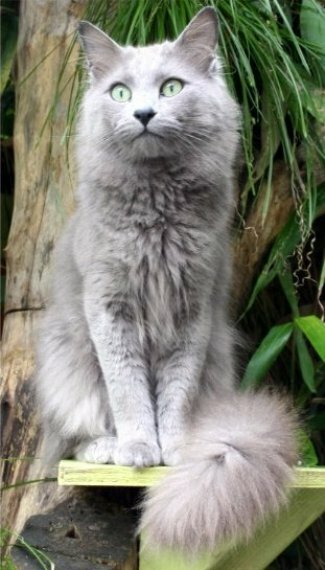 The name Nebelung is derived from the German word for mist or fog, Nebel, and a medieval Germanic saga the Nibelungenlied which is supposed to represent the cat's distinctive silky blue coat. Siegfried was the only longhair blue kitten. Brunhilde was also a longhaired blue kitten, but her coat was lighter than Siegfried’s. These two were the foundation cats for a new cat breed and in 1986 Siegfried and Brunhilde had their first litter and in 1987 Cora Cobb applied to TICA for New Breed status. The Russian Blue was officially designated as an outcross and the development of the gene pool for this new cat breed was continued by allowing the addition of foundation cats. A unique standard was developed for this new breed of cat using an interpretation of early 19th century cats that were imported to England. 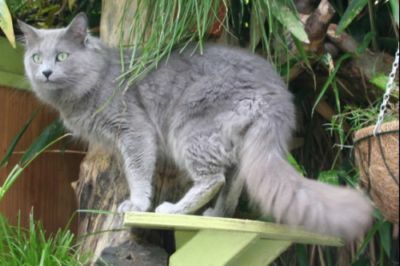 In the late 1980’s the cat fancy picked up momentum in Eastern Europe and the Russian Blue was redeveloped, providing an influx of foundation cats for the new Nebelung breed. The Nebelung was officially recognized for championship competition in 1997. The Nebelung is a medium sized muscular cat with a long plumed tail. The ears are large and well proportioned on the head. The eyes are wide-set and range from yellowish green to green in color. The long body has a medium length coat that is silky to the touch and shimmers with silver tips. The coat is dense so you will have to groom the cat at least twice a week to remove any loose hair and to prevent tangles. This rare cat breed resembles early nineteenth century longhairs that may have had their origins in Russia. The Nebelung cat breed is sensitive and shy and needs proper introduction to strangers, children and other pets. When a Nebelung kitten is brought into the household it should be given ample time to adjust on its own terms and in its own time. Once this long haired silver cat feels at home, you will be showered with affection and cuddles. You will have a faithful companion that will assist you with your daily tasks. This rare cat breed is affectionate and people-orientated, but prefers to be in the company of familiar people.